GRIFFORM ~ Manufacturer of Custom Shower Pans, Corian Sinks, and Innovative Corian Products. GRIFform INNOVATIONS® is a veteran owned company. GRIFform® was honored to be selected as the winner of the 2017 EFA Product Innovation Awards. A panel of judges have determined Overflow Protection to be the most innovative and unique product serving the senior living design industry. This most recent and spectacular addition to the industries need has been developed by GRIFform® because of user demands. "Overflow Protection", is available on any style. GRIFform INNOVATIONS® Barrier Free Trench Drain Pans are all pitched from the entry floor level to the opposite wall with minimal slope. This style of shower pan is a good option for transfer and roll-in operations. GRIFform INNOVATIONS® Barrier Free Sloping Shower Pans are all pitched from the entry floor level to a completely variable drain location with minimal slope. This style of shower pan is a good option for larger walk in areas that satisfy easy movement and assisted care. GRIFform INNOVATIONS® Barrier Free Ramping Entry Pans are often referred to as Low-Egress showers because the entry has a sloping ramp that creates a crown into the shower. GRIFform INNOVATIONS® offers custom shower pans made of durable solid surface by DuPontTM Corian®. Combining beauty and function allows this versatile material to accommodate all your custom pan floor needs. GRIFform INNOVATIONS® Shower Accessories offer a wide array of options to compliment your individual needs. Combining from and design with a large pallet of color. GRIFform INNOVATIONS® of Glide, Oregon is a diverse and leading-edge manufacturer of innovative Corian® products. We provide solutions for healthcare, education, military, hospitality, residential contractors and home owners. 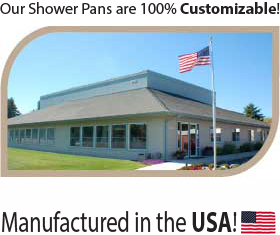 We specialize in Custom Shower Pans and Sinks. Whether you’re intending a small job, renovation, expansion, complete home remodeling, or new construction, we have the solid surface products to complete any project. Whatever we do, we do it with Distinctive Excellence. Some products may be available in materials other than Corian® and Hi-Macs®. Please contact us for details. Phone: 541-496-0313 | Copyright © GRIFform Innovations, Inc. | All Rights Reserved.